I love all the various farm stands that pop up around town in the summertime. It’s so refreshing to be able to buy things that are in season and also support our local farmers (I also love the convenience of being able to pull right up and peruse, all the while my 13 week old and two year old are sitting comfortably in the air conditioned car). Using fresh, seasonal ingredients will make a world of difference in the meals you produce. An otherwise boring pasta salad can be turned into something extraordinary with the addition of a few of summers finest bounties. Add a little olive oil, S&P and some luscious melon for dessert and you’ve got yourself a light, summer supper that sings. Boil pasta according to package instructions. Drain in colander and set aside. Bring water to boil in a large pot. Add corn on the cob and blanche for two minutes. Be careful not to let it go for much longer than this. You want the corn to have a nice pop when you bite into it. When two minutes is up, remove corn from pot with tongs and let cool in a medium bowl. When corn has cooled enough to touch, take a sharp knife and slice down the length of the cob, removing the kernels in long strokes into the medium size bowl. Follow this procedure for the remaining cobs. 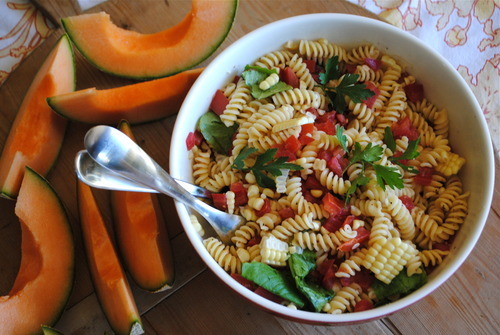 Add diced tomatoes, arugula, and pasta to the bowl with corn. Toss and stir to evenly disperse all ingredients. Drizzle and toss in olive oil. S&P to taste. Add S&P a little at a time until you reach desired taste (Remember: You can always add, but can’t take away). Serve pasta immediately (salad tastes better when it’s just shy of warm). Refrigerate left-overs. Side note: I would’ve loved to have tossed in some fresh basil in this recipe, but didn’t have any on hand. Post and recipe by Bri.